St Joseph’s is a one and a half form entry primary school situated in the heart of Derby City. We are a culturally diverse school with a growing number of languages spoken (33 at present). Our school has an EAL population of 49%, 20% Pupil Premium children and 17% Special Educational Needs. The percentages for social deprivation at St Joseph’s range from 42% to 65% across the year groups in school. Children entering our FS2 class have very limited language skills and story knowledge due to a number of factors. Following results in 2013, writing was a key focus for improvement across our school. This was the start of our journey with Talk for Writing. Although many of our classes were using the TfW strategies across school, it was not as consistently embedded as it needed to be. As a school, we introduced our non-negotiables for teaching English through TfW and our teachers’ passion and confidence in teaching writing through TfW has grown. As a leadership team, we have a strong commitment to staff training and all our teachers have been to other TfW schools across the country and some have attended Pie’s training conferences. We have seen our children’s enthusiasm for writing grow from strength to strength and this confidence in writing is reflected in our results. Our results have increased from 76% to 92% at L4+ in KS2 (9% – 35% L5+), 45% to 80% L2b+ in KS1 and 59% to 80% at expected (14% exceeding) in FS2 (data from 2013-2015). Expected progress in writing at the end of KS2 has moved from 90% in 2013 to 98% in 2015. More than expected progress has increased from 17% to 36%. TfW is now firmly embedded across school from FS2 to Year 6 and our FS2 children become storytellers very quickly on entry to our school. Every classroom reflects the consistent approach to TfW across our school. 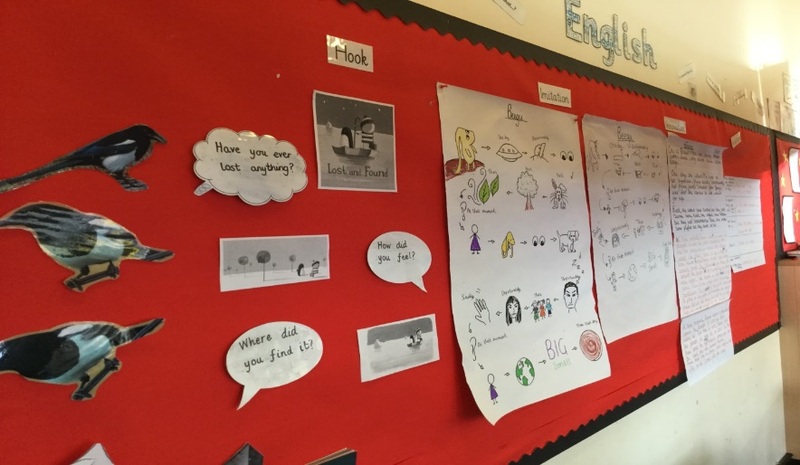 Our working walls show the process from ‘hook’ to ‘published pieces’ of writing. Our washing lines display grammar teaching, toolkits and group generated ideas for writing. Please email v.dodes@stjosephs.derby.sch.uk with the date and number of places required. We will then confirm spaces are available by reply and request you complete a booking form. Delegates must have attended the Introduction to TfW training before booking on this course.